As a typical guy, wearing a polo with a pair of jeans meets my attire needs for most occasions. My wife, on the other hand, tends to be more extravagant. For my birthday one year, she took me to a local men’s clothier to be fitted for a three-piece suit. I admit, wearing a custom-tailored suit made me feel more confident and self-assured than ever before. The world of PCBs is similar—when you tailor your design to your manufacturer’s specifications, you can walk away feeling confident and reassured that you will receive a high-quality PCB. It may seem normal to create a PCB design before searching for a contract manufacturer (CM) to build it. However, this sequence of steps actually hinders a smooth and time-optimized product design and development cycle. The most efficient PCB design and development, in fact, occurs when your CM is integrated into the cycle at its early stages. By involving your CM early on, you can reap various benefits, including ensuring that the PCB tolerances used for your design are in line with your manufacturer’s capabilities. But before we delve into the many benefits of having a symbiotic relationship with your CM, let’s look at the traditional PCB development cycle and why it is inefficient. 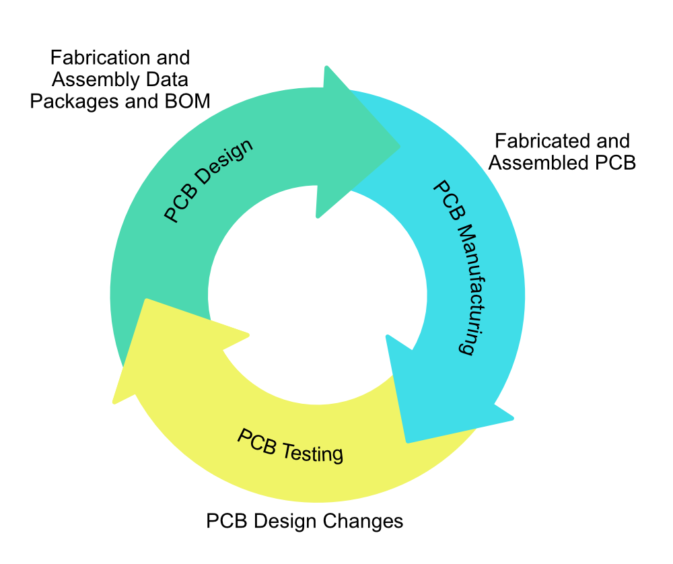 The traditional PCB development cycle model includes the PCB design stage, PCB manufacturing stage and PCB testing or prototyping stage. Because it treats the stages as a set of separate and distinct modules, the traditional PCB development model requires each module to perform its own operations while completely isolated from the other modules. For this model to function properly, each module must be dependent only on receiving the correct input from the previous stage. The process begins with the PCB Design Stage where the fabrication and assembly data packages, as well as the BOM, are created. These design files are passed on to the PCB manufacturing stage, which produces the fabricated and assembled PCB. The PCB is then tested. If the board does not meet the performance objectives of the initial design, then recommended design changes are generated. The recommended changes serve as the input for the PCB design stage of the next cycle. This process is repeated until the testing results are acceptable. Eventually, this model arrives at a solution; however, it assumes there are no issues at the manufacturing stage preventing the board from being made, which is not always the case. In fact, when the board is designed in a vacuum—without considering the restrictions and PCB tolerances of your CM’s manufacturing methods—the chances are quite high that there will be issues at the manufacturing stage. Component spacing – the minimum distance that must be left between adjacent components. Drill hole sizes – the minimum size a drill hole can be. Trace widths and angles – the minimum width and allowable angle for any trace. Board edge clearance – the minimum distance that must be left from the edge of the board. Surface element spacing – the minimum distance that must be left between any surface elements (components, traces and drill holes). 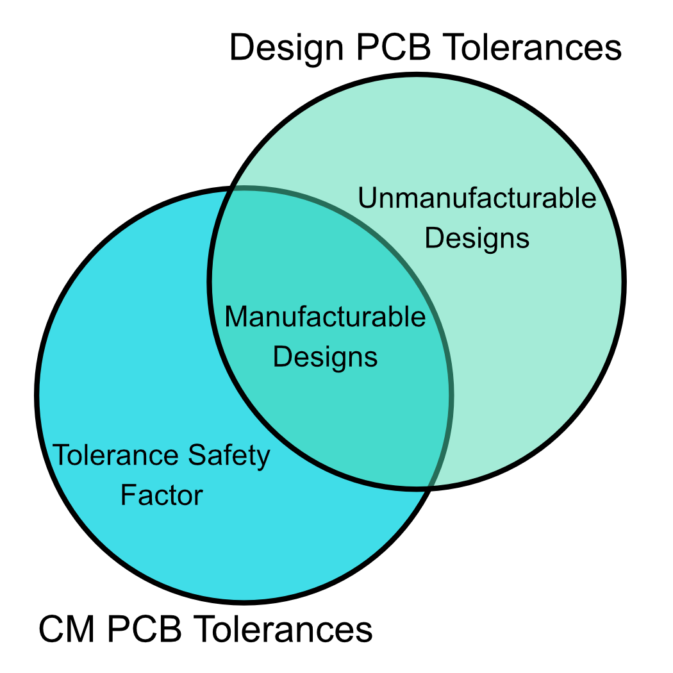 These PCB tolerances guide your PCB layout; however, the list is incomplete and unless matched with the PCB tolerances that your CM uses, probably contains errors. In either case, your CM will most likely be unable to build your boards without some back-and-forth for design changes. This can significantly impact the time and cost to manufacture your PCB, which in turn extends the time necessary to complete the PCB development cycle. In stark contrast to the traditional PCB development cycle, integrating your CM into the design stage means forming a partnership where both parties are vested in the entire cycle. This integrated PCB development approach allows you to incorporate the specific PCB tolerances that determine whether your board can be built and the degree of quality to expect. If the tolerances you used to guide your PCB layout don’t fall within those that your CM’s equipment can produce, then the board cannot be manufactured without redesign. If the PCB tolerances you used during design were not determined based on the methods and techniques used by your CM, then the result may be a low-quality board. Component spacing – to ensure there is adequate space for solder masking, which prevents unwanted and dangerous solder bridges from forming. Present and readable component identification – to ensure components are properly placed and oriented. Drill hole sizes – to meet milling or laser drill capabilities and aspect ratios. Drill hole clearances – to ensure adequate solder mask clearance around plated and non-plated holes. Trace widths and angles – to ensure traces can carry intended current and no acid traps are formed. Copper balance – to provide an even distribution of copper on traces. Board edge clearance – to allow space for depanelization (separation into individual boards). No components straddling board edge – to prevent additional assembly time and cost to manually mount components. Surface element spacing – to allow space for solder masking, which protects the board from oxidation and handling. Solder dams – to prevent solder overflow into unintended regions of the board. The above list provides some of the concerns that can lead to manufacturability problems. However, by partnering with your CM at the beginning of the design stage and instituting DFM PCB tolerances early on, you can minimize the time and cost needed to make your boards. By forming a relationship with your CM at the early stages of PCB development, you can employ DFM PCB tolerances to tailor your design to your CM’s equipment capabilities and technical processes. This helps you enter the prototyping stage of the development cycle feeling fully confident in the quality of your manufactured PCBs. Tempo Automation is the industry leader in custom turnkey PCB manufacturing. As your partners from day 1, Tempo provides relevant DFM and ensures speed and efficiency throughout the board fabrication and assembly process. By merging the PCB design and PCB manufacturing stages into a seamless and precise operation, we help you get to the PCB testing stage faster. Our tailored process helps you minimize the time and cost involved in following the traditional PCB development cycle model. To help you get started with your design, we furnish information for your DFM and enable you to easily view and download DRC files. If you’re an Altium user, you can simply add these files to your PCB design software. If you are ready to have your design manufactured, try our quote tool to upload your CAD and BOM files. If you want more information on DFM PCB Tolerances or how to incorporate them into your design, contact us.